A true Conventional Loan is a home loan secured by Fannie Mae or Freddie Mac. The loans are made by private lenders (banks, mortgage companies, etc.) but are securitized by Fannie or Freddie and sold as mortgage-backed securities which helps mitigate the lenders’ risk. Conventional mortgages comprise about 75% of the mortgage applications nationwide. Private Mortgage Insurance (PMI) is waived at 80% loan-to-value. Whether it’s borrowers refinancing existing homes that have a lot of equity or somebody buying a new home with a large down payment, if you can start out with 20% equity on the loan, Conventional is often the best mortgage option. A Conventional Mortgage is the only option when buying a 2nd home or an investment property. All other mortgage programs require the home be your primary residence. Cancellable or No PMI – if you start with mortgage insurance, it can be eventually removed once you reach 78% loan-to-value. Other loan programs may require the mortgage insurance to be on for the life of the loan. Learn more about PMI on Conventional mortgages in our What is PMI article. Gift funds – if you’re using gift funds to purchase the home, conventional loans are more lenient documentation requirements when it comes to sourcing the gifts funds and who the gift must be from. Competitive rates – for individuals with higher credit scores, conventional loan rates can be very competitive. If you have fair or average credit, then often-times an FHA Mortgage may result in a better rate and overall lower payment. Waiving escrows – if you start the mortgage with 20% equity, conventional loans give you the option to pay taxes and homeowner’s insurance separate from your mortgage payment. Higher loan limits – county loan limits for Conventional mortgage are $484,350 for most single-family residences (but may be higher for multi-unit or in high-cost counties). FHA mortgages are capped at $294,515, making a Conventional loan the ideal if you’re buying a more expensive home. 2nd Homes & Investment properties – if you’re looking to purchase an investment property or a 2nd home, a conventional mortgage is your only option. FHA, VA and USDA require the home you’re purchasing be your primary residence. Conventional Mortgages require a down payment ranging from 3-5% of the purchase price of the home. The 3% options are primarily for first-time home buyers or families with low-to-moderate income; read more about the first time buyer and 3% down qualifications. Lower Payment – the more you put down the less you’re borrowing. Therefore, the lower your payment will be. Lower Mortgage Insurance – PMI is priced based on credit score and loan-to-value, so, the more you put down the cheaper your mortgage insurance will be. Generally, there is a discount in the PMI rate at 5, 10 and 15% down. Take Note: gift funds may be used towards your down payment; however, Conventional Mortgages have the most stringent requirements when it comes to who can provide the gift. Eligible donors must be a relative as defined as a spouse, other dependent, or an individual who is a blood relative through marriage or adoption. The donor can also be a finance or domestic partner. The process for getting a Conventional Mortgage is the same process to get any other mortgage. For a more in-depth look, review our series on the steps to buying a house and review our complete home-buyers guide. In order to get pre-approved, you must complete an application and then help the loan officer document the information in the application. After the loan officer reviews the application and supporting documentation, they’ll issue a pre-approval. At that point you can begin searching for a home! Once you have an accepted offer to buy a house, the loan process begins. You’ll provide the loan officer with a copy of your contract, be asked to sign some disclosures and provide any documents required for initial underwriter review. At the start of the process, the loan officer will order an appraisal, title work and submit all supporting documentation to the underwriter who will review the file compared to the Conventional mortgage guidelines. After the initial review, the underwriter will likely ask for additional items and collect any further necessary documentation to make sure that the applicant, contract, home and loan parameters are all in accordance with the Conventional guides. Once all conditions have been satisfied, the underwriter will approve the loan. This process takes about 20-25 days from the time you get under contract. Once loan approval has been reached, the lender will work with the title company to finalize a settlement statement and closing documents for the closing. Once the settlement statement and closing documents are prepared the applicant will sign all the final documentation and the title company will transfer title and record any necessary documents with the county in which the home exists and then you can take possession of your new home! The Conventional Mortgage program is available to US Citizens, Residents and certain Non-Residents. 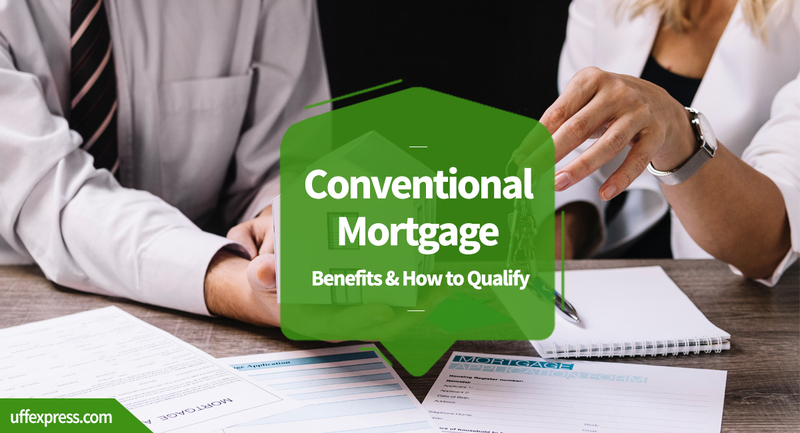 Conventional mortgages do have some of the strictest credit score and debt-to-income ratio requirements, so it sometimes can be a challenge to qualify. Mortgage credit score requirements vary by program, so if your scores are lower there are still other programs available. Conventional loans also have the longest waiting periods for serious past credit issues such as bankruptcies, foreclosures or short sales. The waiting period after a foreclosure is 7 years, which short sales and Chapter 7 bankruptcies have a 4-year waiting period. Below is a basic comparison between the FHA Mortgage and a Conventional Mortgage. Conventional mortgage will allow financing on most types of homes as long as there are comparable properties that have recently sold similar to the home you’re buying. One of the greatest benefits of the Conventional mortgage is that Fannie and Freddie don’t have any real property requirements. Most government loans such as USDA, VA, or FHA, require the appraiser flag issues such as peeling paint on the exterior of the home, missing handrails, or older roofs. If something is flagged that means it will have to be repaired before the borrower can close on the home. Thankfully, with conventional mortgages you do not run into these types of problems. The Conventional mortgage has a lot of pros and cons, but it is the top mortgage program in the country for a reason. If you have good to great credit (690 or higher) and a reasonable debt-to-income ratio, then it’s likely that a conventional mortgage will offer better overall loan terms compared to FHA. Also, if you plan to purchase a 2nd home, investment property, or have 20% equity, then it will either be the only option available or the best mortgage program available. If you however don’t have a large down payment and/or have a lower credit score (under 690), then other mortgage programs may be more advantageous.